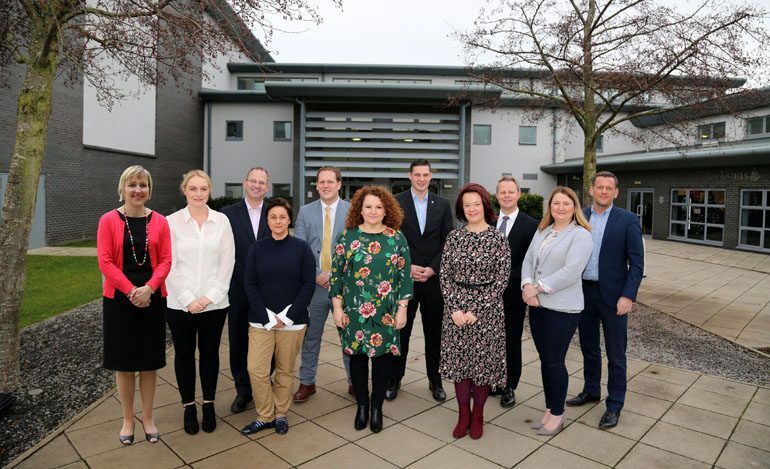 The Aycliffe Business Park Community (ABPC) has been boosted with the appointment of four new members – taking it back up to full strength. The original 11 board members were appointed when ABPC was first incorporated in the summer of 2016. But as some members left the organisation due to other commitments, ABPC started a recruitment campaign towards the end of 2018. The board of directors is now back up to 11, with the arrival of Lisa Fleming, Stephen Gosnay, Sharon Hutchinson and Ben Healey. Lisa is managing director of Aycliffe-based recruitment agency Driver Hire Darlington, Stephen is key account manager at Newton Press, Sharon is operations director of law firm Endeavour Partnership and Ben is a partner in law firm Greystone Legal. They join seven existing members Kerina Clark (Xcel Centre managing director), Pamela Petty (Entreprenising owner), Rachel Townsend Green (Thrive Marketing director), Sarah Slaven (Business Durham County Council operations director), Lee Harris (Mitchell Gordon partner), James Goodliffe (Formula Plastics managing director) and Martin Walker (Mantis Media managing director). Chair Kerina said: “We’re delighted to have appointed four people who have demonstrated a clear desire to build on the work already achieved over the last few years. “Our key mission statement is to develop, sustain and support a vibrant and diverse business park community to contribute to an environment where businesses can grow and develop and to support businesses with opportunities to promote and gain information related to their business. Lisa is a qualified transport manager and has worked within logistics and transport management for the past 14 years. “I am passionate about engaging, strengthening the relationships and driving the business park forward to work together and connect with each other, which in return will support business growth within the business park,” she said. Stephen is key account manager for family-run printing firm Newton Press, which has been based in Aycliffe since it was formed in 1963, after joining the firm in 2017. He said: “There is a huge sense of community spirit both with the residents and the local businesses and this is something I am passionate about. Endeavour Partnership operations director and Newtonian Sharon is based at the firm’s Aycliffe offices, at the Xcel Centre. “Having lived in Aycliffe all my life and seen the work of ABPC, it was a no-brainer to get involved with the group,” said Sharon. Solicitor Ben worked for a Northumberland legal firm before setting up Greystone Legal with Paul Humble in June 2017. ABPC aims to support and aid economic development and economic activity on Aycliffe Business Park, and to promote and supporting the ABP through events and marketing materials, both in print and online. It aims to do this by signposting ABPC members to support, provision and information for their business needs while communicating and sharing skills, best practice and facilitating knowledge transfer within the ABPC. Spread across 400 hectares, Aycliffe Business Park is home to more than 500 diverse and progressive companies, employing around 10,000 people.